There are many rotary speaker emulations. As real as it gets. The best sounding Leslie models in digital form, period. AmpliTube Leslie® is the result of the exclusive collaboration between the IK Multimedia team and Hammond USA and Suzuki Music Corp. of Japan with the aim of perfectly recreating, for the first time ever, the truly authentic sound of the legendary Leslie® amps and cabinets in the digital world. The outcome is not a mere emulation of reality, no matter how close to the original it might be, it is rather an exacting digital recreation of it, carrying the official Leslie® seal as a guarantee of the indisputable excellence of what is the definitive Leslie collection for the most discerning producers, composers, keyboardists, guitarists and creative singers. rotary-speaker cabinets that you can use to record in your DAW or to play live, taking advantage of AmpliTube’s world-class 64-bit processing. AmpliTube Leslie has a distinct advantage over its competitors with its circuit-modeled amplifiers which are critical to recreating the signature tone of these incredible units, especially when overdriving the amp circuit, typical of genres like rock and blues. IK’s innovative Dynamic Interaction Modeling Technology can analyze and model the behavior of every electronic component in the circuit, as well as their mutual interactions, thus reproducing the exact behavior of the entire system in a non-linear and dynamic way. Leslie cabinets are very complex to reproduce in the digital realm because of the number of time-variant effects that happen within the sound simultaneously during the rotation of the rotors. These include the Doppler effect plus continuously and smoothly variable delay, frequency and phase response as well as variable reverberation/reflections inside the cabinet walls, and that is just scratching the surface. 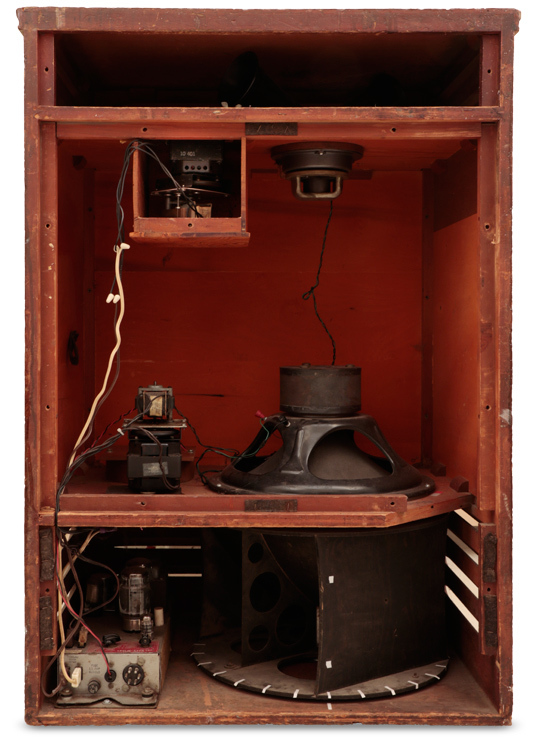 These complex machines have been recreated using Volumetric Response Modeling, a breakthrough proprietary technology from IK, that includes modeling of some parts and capturing the real audio behavior by miking up the cabinets in a high-quality room to extract the essence of their original tone. Only this approach can offer digital Leslie models that are indistinguishable from the originals when placed in the same room and miked the same way. You can think of these digital Leslie models as providing actual audio recordings of the real cabinets, they are much more than an emulation algorithm! The singing tone of these legendary cabinets is finally captured and at your fingertips. Plus, all horns and drums are recorded in stereo, making it possible to mix the four mics the way you prefer to fit all possible production needs. All controls are divided into three pages: Setup, Channels and EQ, while the speed controller is always visible for quick access. Suitable for pop, rock, jazz and blues, when you think of the "Leslie sound," you are most likely thinking of a 122. A vintage unit from the early 70s has been modeled here, and this has a slightly warmer sound when compared to the 122A. The Leslie 122A is the modern take on the most famous Leslie model, with a balanced input to the amplifier and a medium-tall cabinet that provides superb bass response. This has a slightly more open and upfront tone when compared to the classic 122. The Leslie 147 is another classic Leslie model with a different connector, slightly different power amp, an unbalanced input to the amplifier and slightly shorter cabinet. The overall sound is very similar to the classic 122 but with some noticeably and musically relevant differences. The one we modeled is a vintage unit from the mid 60s, with no reflectors on the horns, which gives another flavor to the sound and an even more tangible sonic difference from the classic 122. 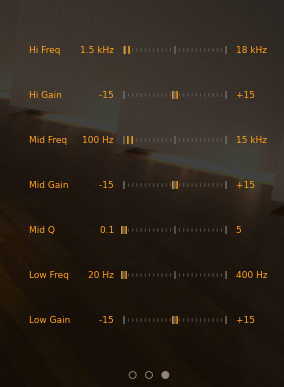 GAIN: controls the amount of signal going to the amp and the level of saturation. VOLUME: controls the amount of signal going into the Cabinet. INPUT HPF: controls the frequency of the high pass filter of the input signal. The Leslie 3300w is one of the most powerful models ever, featuring a 300-Watt RMS solid-state amplifier with a real vacuum tube preamp. Its sound signature is especially suitable for pop, rock, jazz and blues. TUBE DRIVE: controls the amount of signal being “warmed up” by the tube section. TUBE MODE: controls the amount of tube saturation, from Soft to Hard. Guitarists of all kinds praise the G37 for its unmistakable tonal character. The onboard solid-state guitar amplifier with its tube preamp section can go from pristine-clean to down-and-dirty, for a variety of tonal nuances that only Leslie speakers can provide through a compact dual-rotor cabinet with a vintage voiced V30 12” speaker suited to guitar. The Studio 12, designed as a more portable amp for keyboard players, also uses a tube-driven solid state amplifier into a dual rotor design but has a 12” Eminence bass speaker tailored to the wider low frequency range of organs. VOLUME: controls the amount of signal going to the Cabinet. CONTOUR: controls the amount of “warmth” created by the tube of the preamp. MIC SETUP: changing the way you mic the Leslie cabinet, also affects the perception you will have on the rotation, or “doppler effect”. You can choose between a 90º mic position, which is the most common one giving a non-symmetric perception of the rotation, to the 180º mic position which is less common but sometimes preferable when a more symmetrical left and right modulation is what is needed. The overall timbre and sonic character also changes between the 90°and 180° because of the different actual microphones position that were used when recording the originals, this provides even more versatility. 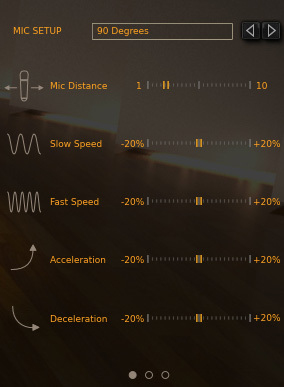 MIC DISTANCE: you can decide how far from the cabinet you want the mic to be. ACCELERATION/DECELERATION: decide the amount of time that is necessary to go from fast rotation to slow and vice versa. Here you have full mix control on the four microphone channels used when capturing the Leslie speakers. 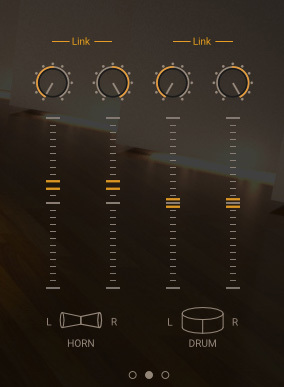 Each channel has its own level and pan control so that you can setup the Leslie mix as you prefer. You can for example set the drum using just one channel panned centered to have solid monophonic low frequencies, and use the horn in stereo, or you can get immediate 70s sonic flavor by using just one mic on the top and one on the bottom panned just a bit apart, just to mention another example. At the end of the chain we added a full parametric EQ to let you further shape the sound to fit your musical ideas even better. The AmpliTube Leslie collection is ideal on all sources and not just organs and keyboards. It makes for a very powerful creative tool on applications that range from playing, mixing to sound design! Try it on guitars, on the synths, on lead vocals, background vocals, sound effects and much more! Only AmpliTube gives you the ability to “try before you buy.” You can download full working models of any of the AmpliTube Leslie Amp and Cab from the AmpliTube Custom Shop and try them out free of charge. Use our line of iRig guitar and bass interfaces and foot controllers to connect your instrument to your iPhone, iPad, Mac and PC to play through and control AmpliTube. AmpliTube® is a registered trademark property of IK Multimedia Production. Leslie is a trademark property of Hammond Organ/Leslie, wholly-owned brand subsidiaries of Suzuki Musical Instruments Mfg., Ltd. of Hamamatsu, Japan, used under license. All other product names and images, trademarks and artists names are the property of their respective owners, which are in no way associated or affiliated with IK Multimedia. Product names are used solely for the purpose of identifying the specific products that were studied during IK Multimedia’s sound model development and for describing certain types of tones produced with IK Multimedia’s digital modeling technology. Use of these names does not imply any cooperation or endorsement. Mac and the Mac logo are trademarks of Apple Computer, Inc., registered in the U.S. and other countries. Windows Vista and the Windows logo are trademarks or registered trademarks of Microsoft Corporation in the United States and/or other countries. The Audio Units logo is a trademark of Apple Computer, Inc. VST is a trademark of Steinberg Media Technologies GmbH.